One of the hardest parts of switching to real food is finding affordable places to buy that food. 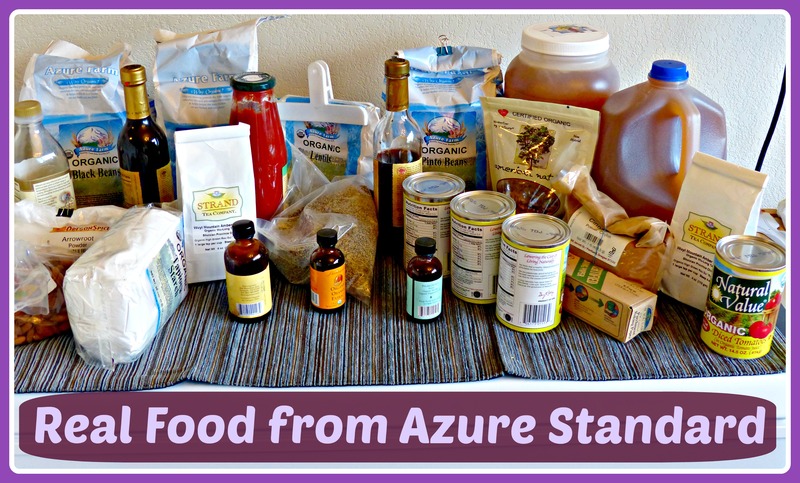 I really enjoy sharing the good deals I get at Costco, so today I thought I’d share another resource in my real food arsenal: Azure Standard. Azure Standard is natural and organic foods retailer that delivers food by truck to pickup locations across the western United States. At the moment they deliver to most states west of Missouri, as well as to a few more eastern states. Depending on where you live, there may be a drop point quite close to your home. Ordering from Azure is easy. There is no membership fee to order–you just sign up for an account through their website and then join a local drop point group. Each group orders once a month. You place your order online, then go meet the truck at a pre-arranged time when it drops off the group’s order at your local drop point. One of the things that I especially like about Azure is that you don’t have to order most things in bulk. You will get a bigger savings if you order a bulk amount of something, of course, but if you only need a small amount you can often just order that and still save money. You can also order modestly bulk amounts of things–like five pounds of beans, for instance, instead of twenty-five–which helps you save money but is more realistic to store if you live in a small home. Azure’s prices tend to be very good. This is not true of everything, of course–the produce, in particular, I find to often be much more expensive than what I would pay at my local health foods store. It’s worth it to do some price comparison with your other food sources before ordering, but for many things I believe I save a significant amount of money by buying through Azure. Do you order from Azure Standard? What are some of your other favorite real food resources? I absolutely LOVE Azure Standard! Unfortunately where I live now, they don't have a drop off point, but I'm hoping they'll get up here one day soon. We love azure, too! They also havgreat cleaning and body products! I love their raw honey, bulk grains and beans, organic chicken feet (for broth), frozen bulk organic veggies, and their price for Green Pastures fermented cod liver oil is the best deal around! If you need items for your garden or livestock they have great prices on those too! I do wish their shipping charges were consistent for all of their regions. We just moved up to UT from TX and it is much more expensive to have my order shipped to me now. I sponser a drop point with Azure and am happy to see it growing. As with anything you must be a smart consumer and know your prices. With some items Costco's organic items/price may be less but if not I always check Azure. Yes, having to go meet the truck can seem like a pain but I share the responsibilty with family and it's only one day a month. Plus as you continue with your shipments you become friends with your driver. It's a good feeling knowing that if something were to happen he is easy to work with. If you don't have a drop ship site by you call Azure and see if you can sponser one. Their customer service team are acceptional as well. Bummed, I always see Azure pop up on frugal living blogs...but they don't deliver yet to southern VA. Of course, I live in a pretty rural area, so I'm used to it by now!! I cannot find Green Pastures fermented cod liver oil on the website. Can you tell me where you found it at Azure? I don't think they carry fermented cod liver oil anymore. Where did you see me mention it? I mentioned it in my comment above. They still carry it but you need to call them directly for the item #'s. The price they charge for it is actually lower than you get through Green Pastures so they have an agreement to not publish it in their catalogs or list it on their website anymore. If you enter the # in the shopping cart section it will pop up. I found this out when I was a drop manager and was told that I could share the #'s within the group, but not outside of that.